If you don’t do anything with your student loans, you’re automatically signed up to a generic repayment plan that typically has even payments for 10 years. However, that can be tough, especially right after graduation. Maybe you’ve just started working, or maybe you don’t even have a job yet and you’re just side hustling to make a little money? Maybe that standard repayment plan option just isn’t working for you, and you’re worried what will happen if you don’t make a payment or you default. If you’re considering student loan deferment or forbearance, or if you’re thinking about simply ignoring your student loan payments, don’t! 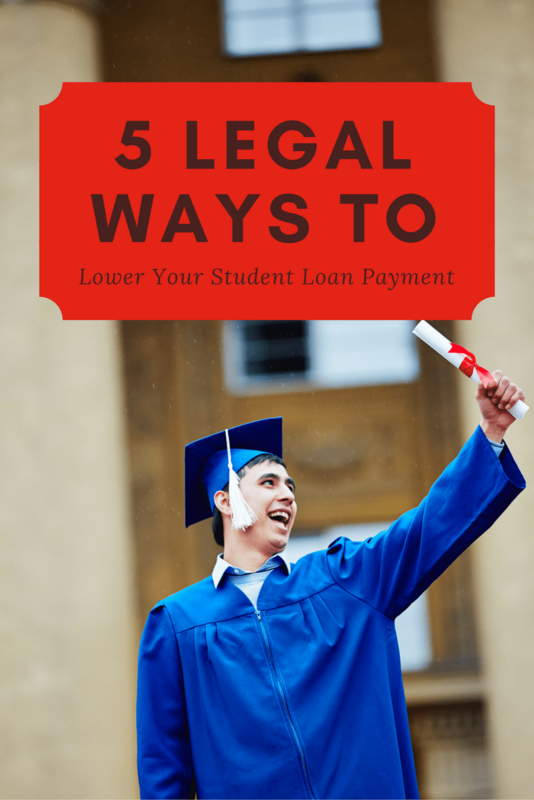 Here are five legal ways that you can lower your student loan payment so you don’t have to go into default. You have $38,000 in student loan debt. Your standard 10-year repayment plan amount would be $381 per month. We’re going to assume you only make $24,000 per year (remember, you don’t have a job yet after graduation). The extended repayment plan extends out your standard student loan payment from 10 years to 25 years. The extended repayment plan is available to all Federal student loan borrowers – no income limits apply to this. So, it’s always an option for borrowers. In our example, if you were to switch to the extended repayment plan, you would lower your student loan payment to $196 per month. You can switch to this plan simply by calling your lender. The graduated repayment plan starts off your repayment at a low amount, and it rises over time. There are two versions – the 10 year graduated plan, and the 25 year extended graduated plan. The idea with this plan is that you’ll earn more in the future, so you start low and your payment grows. Both of them start with a low payment amount. On the 10-year graduated plan, you would lower your student loan payment to $213 per month in year 1, but remember it will rise to as high as $638 per month in year 9. On the 25-year graduated plan, you would lower your student loan payment to $120 per month in year 1, but remember it will rise to as high as $359 per month in year 24. You can switch to the graduated repayment plan simply by calling your lender. Income-based repayment (IBR) is exactly what it sounds like – your payment will be calculated based on your income. It’s a formula that takes into consideration your income, the poverty line for your state, and will set your payment at 15% of your income (10% for new borrowers). The other great aspect of IBR is that you qualify for student loan forgiveness on any amount of debt left on your loan after 20 or 25 years, depending on when your loans originated. We call this the secret student loan forgiveness program. If you took out your student loans before July 1, 2014, your payment would be as low as $77 per month. If you took out your student loans after July 1, 2014, you could lower your student loan payment to as low as $52 per month. Remember, you need to re-certify your income every year and your payment could change as your income changes over time. You can sign up for this plan by calling your lender or going online to StudentLoans.gov. Pay As You Earn (PAYE) and Revised Pay As You Earn (RePAYE) are the two newest student loan repayment plan options, and they also come with student loan forgiveness after 20 years. They both calculate your payment a little differently, but for our situation, they are both identical. The big differentiator is if you’re married – PAYE allows just one income to be used, but RePAYE requires both incomes to be used. We discuss the math of married filing separately for IBR and PAYE here. With both of these plans, your payment will be calculated based on 10% of your discretionary income. As such, you could lower your student loan payment to as low as $52 per month. Just like IBR, you need to re-certify your income every year, and your payment could change as your income changes over time. You can sign up for this plan by calling your lender or going online to StudentLoans.gov. Finally, if you have private student loans, you don’t have a lot of options. The best option is to simply refinance your student loans. There are a lot of factors in whether this could actually lower your payment, but that’s why we recommend using a free tool like Credible that allows you to quickly and easily see what student loans you’d qualify for, and if it would even help you lower your payment. For example, if you currently have a $38,000 student loan, and it’s at 6.8%, you could be paying $437 per month. If you’re able to refinance your student loan with Credible to 4.25%, you could lower your student loan payment to $389 per month. Plus, College Investor readers get a special bonus of $200 when they close their loan! You won’t find a better deal! Check out Credible here. If you want more help, start with your lender. They are paid to help you with your student loan debt. They might not be able to answer everything, but it’s a good starting point. The biggest challenge I see with new student loan borrowers is fear that they can’t afford their payment. As a result, many opt for student loan deferment or forbearance. Some even simply ignore their student loans and hope they go away. 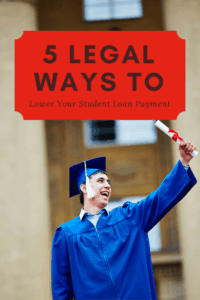 So, before you simply stop paying your student loans, look at these options to lower your student loan payment. For Federal loans, it’s pretty easy to do. For private loans, it’s a bit more challenging, but you can make it happen. Refinancing my wife’s loans saved us a boatload of money. It isn’t right for everyone, but if you can get down into a lower interest payment that’s usually the way to go! That’s great to hear! What platform/company did you go with to refinance? I am with Fed Loan Servicing. Fedloan doesn’t refinance loans. Did you consolidate? It sounds like you’re working towards PSLF for loan forgiveness. You can request that FedLoan research and find the missing payments. You can contact them directly, or reach out to their Ombudsman here: (717) 720-7605. You can also file a complaint with the CFPB and see if that escalates things.